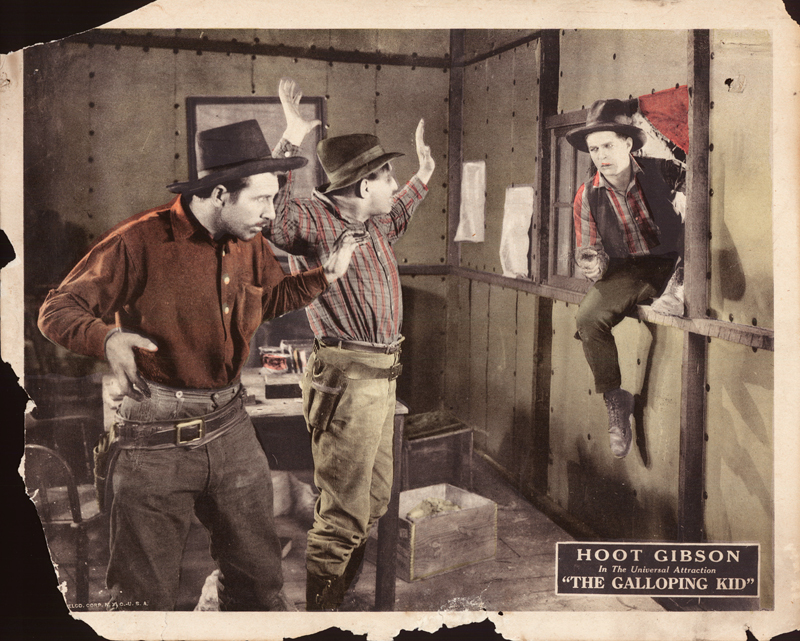 Hoot Gibson stars in "The Galloping Kid," distributed by Carl Laemmle's Universal Film Manufacturing Co. in 1922. 11x14-inch lobby card. Lithograph, plates misaligned. We don't know where this film was shot, but we do know Edmund Richard "Hoot" Gibson — a major star of screen and rodeo — would go on to purchase the Baker Ranch Rodeo (later called Saugus Speedway) in 1930. 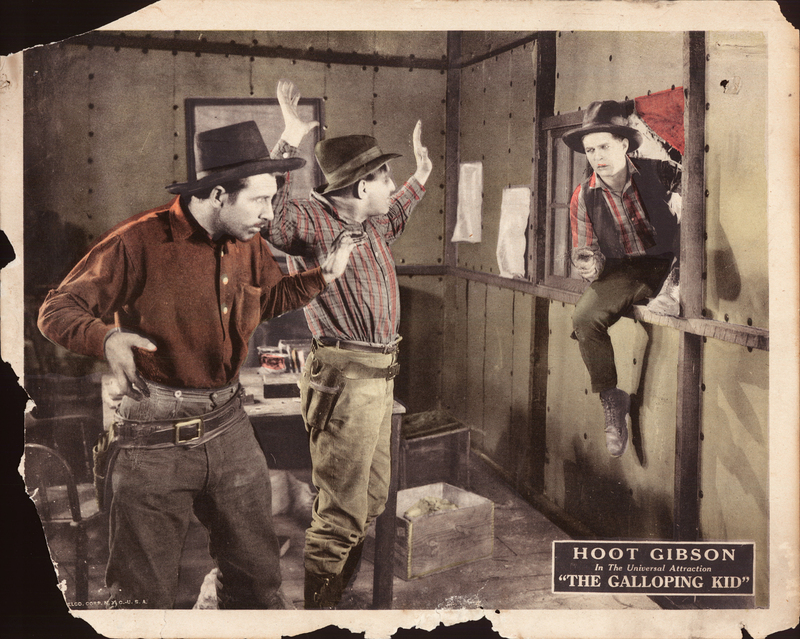 "The Galloping Kid" runs 50 minutes and was released Sept. 11, 1922. Directed by Nat Ross and written by Arthur F. Statter and A.P. Younger from a story by William Hamby, the film stars Gibson as "Simplex" Cox, Edna Murphy, Lionel Belmore, Léon Bary, Jack Walters and Percy Challenger. Cinematography by Arthur Reeves. Edmund Richard Gibson earned the nickname "Hoot" when he worked as a messenger for the Owl Drug Co. He was born August 6, 1892, in Tekamah, Nebraska and appeared in more than 200 films (including short features) between 1910, when he earned $50 for his role in "The Two Brothers," and 1960, when he made an uncredited appearance in "Ocean's Eleven." Gibson did most of his work as a silent cowboy actor between World War I and the early 1930s. He directed a bit in 1920-21 and produced some of his own films from 1923-30. The 5'9" Hollywood giant died of cancer on August 23, 1962, in Woodland Hills — five days before a wildfire burned down Gene Autry's Melody Ranch in Placerita Canyon, where Gibson made some of his movies. "Roy Baker purchased a 40-acre tract east of Bouquet Junction during 1923, starting construction on a rodeo arena a year later. Hoot Gibson bought the ranch and stadium in 1930, putting on shows that attracted such stars as Tom Mix, John Wayne and Clark Gable. In 1934 Gibson sold out to Paul Hill, who ran the Western Livestock yards and leased it to film companies for three years until a huge flood filled the home and arena with mud and debris. (Hill) was unable to make payments, and the bank repossessed the property, which was eventually taken over by a professor of economics at Occidental College, William Bonelli (who started the Santa Clarita Water Co. and built one of the first local housing tracts in the late 1940s). Today (the rodeo arena) is known as the Saugus Speedway." LW2517: 19200 dpi jpeg from original lobby card purchased 2013 by Leon Worden.